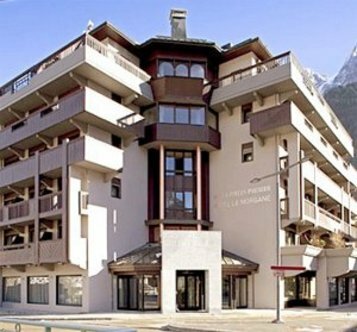 Ideally located in the heart of Chamonix, the Best Western Premier Le Morange is within close proximity of the Aiguille du Midi cable car, Le Morgane combines the elegance of a 4 Star hotel with the relaxed, sporting mood of Chamonix, offering a breathtaking view of the surrounding mythical peaks. Our 4 star hotel, B/W Premier Le Morgane boasts 56 rooms and suites with balcony or terrace. After a full day of activities, you will enjoy our spa, with an indoor heated swimming pool, sauna, and Turkish bath. We also propose massages and esthetical cares. You may also have a cup of tea or a glass of wine, in our bar, in front of the Mont Blanc, next to the fireplace. We invite you to discover our restaurant "Le Bistrot", an inventive cuisine thanks to our Chef Mickey Bourdillat who received recently a gastronomic award.